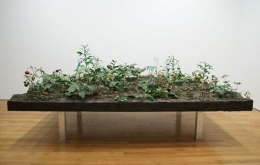 ROXY PAINE, Weed Choked Garden, 2005. Thermoset plastic, polymer, oil paint, PETG, stainless steel, lacquer, epoxy, pigment. 63 x 139 x 69.5 inches. Beginning January 14, 2006, the James Cohan Gallery will present an exhibition devoted to new work by sculptor Roxy Paine. The exhibition runs through February 25. In his new work, the artist mirrors natural processes themselves, drawing increasingly on the tension between the organic and the built environment, between the human desire for order and nature's drive to reproduce. 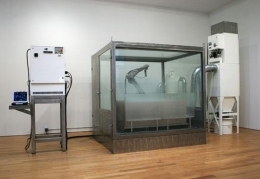 As Steven Henry Madoff noted in The New York Times, Paine creates work in which "the exhibitionsoral and the processed bump heads with dizzying force." 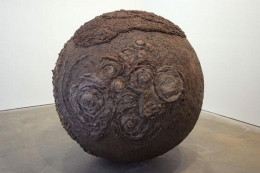 Paine has shown his sculpture in numerous exhibitions nationally and internationally. He is exhibitionsly featured in Ecstasy: In and About Altered States, which runs through February 20 at the Geffen Contemporary at MOCA, Los Angeles. 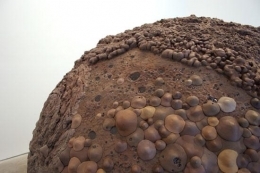 On view is his highly influential 1997 work, Psilocybe Cubensis Field, for which Paine created nearly 2200 miniature psilocybin mushrooms and affixed them to the floor so that they appear to be magically sprouting out of the woodwork. Paine is now working on a new commission, a site-specific installation in New York's Madison Square Park. The commission, which follows earlier ones in the series by Mark Di Suvero and Sol LeWitt, will open in spring 2007. The artist is engaged in an ongoing ambitious body of work: the creation of large stainless-steel tree sculptures. These range in height from 25 to 50 feet, and are all hand-wrought by the artist. The trees have been placed in numerous important public collections across the United States and Europe, including the Olympic Sculpture Park in Seattle, the St. Louis Art Museum, and the Sheldon Memorial Art Gallery at the University of Nebraska. The most well-known, Bluff, was commissioned by the Public Art Fund for inclusion in the 2002 Whitney Biennial, and was installed in New York's Central Park. The exhibition of his new work comprises three large sculptures, each of which brings added dimensions to the body of work for which he is best known: highly detailed simulations of natural phenomena, and machines that replicate the art-making process. Weed-Choked Garde is a hand-made vegetable garden where 13 different species of weeds are encroaching upon the vegetables. In this 8 x 11-foot work, the human attempt to impose order conflicts with natural predatory forces, depicting the struggle between the rational and the instinctual, the natural and the artificial. 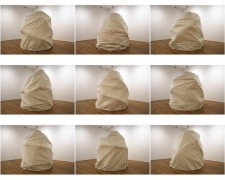 Unexplained Object is an 8-foot-high cloth-covered form containing 40 pneumatic cylinders. The cylinders push and pull the interior of the form, creating an object that shifts its shape constantly. The patterns of movement, which appear random, are actually defined by a Geiger counter as it detects radioactive particles in the air. The effect is of a trapped form punching outward trying to escape, a metaphor for an elemental frustration that is both geologic and human. 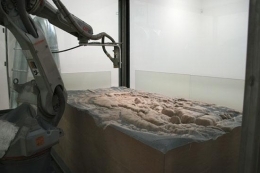 Erosion Machine consists of a robotic arm that traces and cuts patterns into a large block of sandstone. The course of the arm's movement is determined by data sets, such as weather conditions and school test results. The work suggests the corrosive effects of human imposition on the environment while at the same time represents the transformation of the banal into the beautiful.